dessert girl: Vote for Heather Dutton's Spoon Print! Vote for Heather Dutton's Spoon Print! Graphic designer and Mixing Bowl contributor Heather Dutton contacted me today about a design contest that she is taking part in over at the fabric Web site Spoonflower. 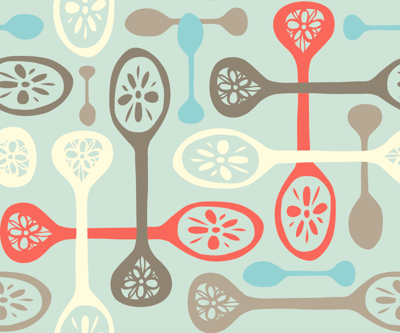 Designers were asked to create a fabric design that incorporated images of spoons and flowers (like the name of site). The winner gets 5 free yards of their design and the winning fabric will be available for sale on Etsy for 1 week. So, you'll get a chance to buy the winning fabric! The winner will be announced Thursday. Voting is really easy. All you have to do is click your favorite. No registration is required. Heather's design is #7: Fleur de Cuillère by Heather Dutton. Personally, I LOVE Heather's print and I hope that it wins, but you can vote for your favorite design right here. 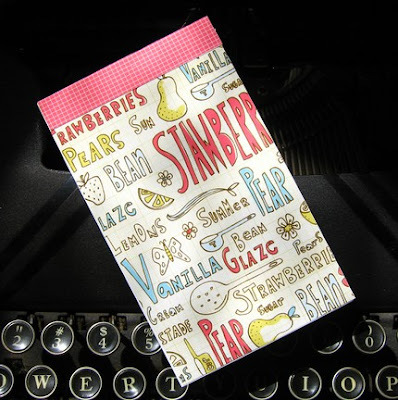 In addition, if you liked the design that Heather created for her Mixing Bowl recipe last July, you'll be happy to know that Heather has some lovely new notebooks ($5) in her Etsy shop that feature the strawberry and pear print that she created for her post. Click here to check them out.